More info:From £2940 - £3099 excluding flights. Prices based on 2 adults sharing. Single supplement available. Mimimum age 14. Sri Lanka is famous for its wildlife including elephants and turtles, and our visits to the national parks at Wilpattu and Minneriya helps to support the conservation of the animals and their habitat. This is both through the financial benefit of or entrance fees but also the interest shown by our visits to such places helps provide the government and local people alike with an incentive for their preservation for future generations to enjoy. We visit the Wilpattu National Park which is much less touristy than the better known Yala National Park. This gives a much better experience whilst acting in a much more responsible manner – fewer vehicles and people converging on the animals. Our hotels are mostly locally owned and a great example is the Lake hotel at Dambulla. The hotel takes its sustainability seriously and has installed a biomass boiler which produces 200 kg of steam per hour and drives the chiller. This consumes less than one tenth the electricity of a conventional chiller. Over 40% of the hotel’s energy requirements is solar powered, including all of the hot water. Interestingly the hotel has 1.5 acres of farmland that it uses to produce the fruits and vegetables served in its restaurant. They also host 4 bee colonies which pollinate and benefit the local agriculture and environment. 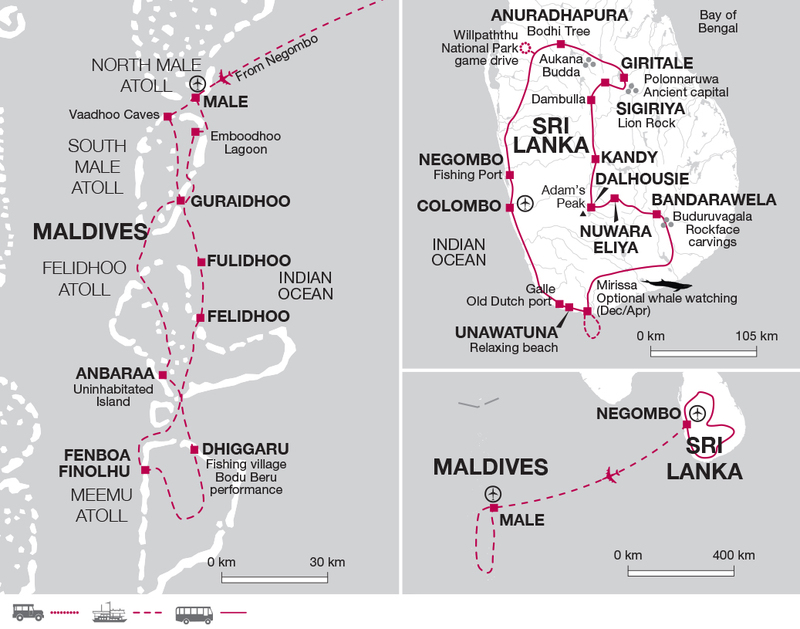 In Sri-Lanka most of our travel is done by mini bus, despite the distances but we also use trains and boats that are less environmentally harmful than large coaches. Whilst travelling we have the chance to eat in local restaurants or markets, rather than tourist hotels, enjoying wonderful locally produced food. Our cruise in the Maldives not only allows us to enjoy the amazing scenery and snorkel the fabulous coral reefs, we also get a unique insight into island life and culture on our many visits to remote islands, meeting the locals and sometimes getting a chance to visit their homes and see some of their traditions and ceremonies a world away from the tourist areas. When snorkelling, we follow guidelines that ensure we protect wildlife and coral and that we do not have any adverse impact on the environment we visit. On most departures we are able to engage in a short beach cleaning exercise so we leave these beautiful islands in a better state than we found them. This trip gives us a great experience of the cultural heritage, natural beauty and friendly and hospitable people in Sri Lanka and the Maldives. By using local tour leaders you’ll be able to enjoy and learn about many aspects of life in these countries not accessible on other trips, and of course it is a significant way to create local employment. In Sri Lanka you’ll be supporting the local economy through using locally owned hotels and restaurants. Also some of our excursions directly benefit vulnerable communities. We are proud to have adopted an orphaned baby elephant in Sri Lanka’s Udawalawe National Park several years ago. Serendip fell into a trench when she was only a few months old but was rescued and was returned into the wild – where she belongs - when she was 5 years old. In the Maldives we avoid the large International resorts altogether, stopping at small local fishing villages on lesser known atolls to gain a genuine insight into the traditional Maldavian lifestyles away from the tourist industry.